Remember, it's all about comfort. Clients, of course, claim that other, more objective criteria are in play. But it ultimately boils down to how comfortable the client feels about the prospect of working with your firm. Acknowledging this will guide how you approach the interview, as the points below illustrate. Strive for authenticity over polish. 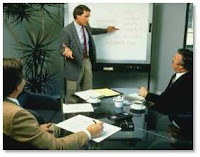 Many presentation coaches focus on performance--a well-crafted message, smooth delivery, professional presence, etc. I don't want to dismiss the value of good execution, but you can make a polished presentation and come off as phony. That won't help you create comfort. One of my foremost objectives is helping the presentation team be themselves--genuine, confident, enthusiastic, trustworthy. Engage your audience rather than talk at them. The client asked for a 25-minute presentation, but do you really want to waste that valuable time talking at the selection committee instead of with them? In my experience, you can typically add some dialogue to your presentation by asking a few well-placed questions. This makes the interview seem a little less formal and imposing, which should put your team in position to better show their strengths. For more on this strategy, check out this earlier post. Don't rehash your qualifications. You made the shortlist, so you're qualified. One of the most common mistakes is to spend much of the interview making a sales pitch. Unless the client specifically asked for such information, don't go there. Talk instead about your understanding of the client's needs, your proposed solution, and how you're going to execute the project. In other words, focus on the client instead of your firm. Talk about the working relationship. Almost no one does and yet this issue is at the forefront of the client's concerns: What's it going to be like working with these guys? Will they be responsive? Do they understand what we expect? Obviously, if there is an incumbent, these questions become even more relevant (they already know what to expect from the incumbent). If you really want to be different, talk about your process for delivering great service to the client (see this post for more). With time limited, say less and slow down. Most presentation teams I work with start out trying to cover too much ground in their allotted time and add more detail than necessary. Inevitably this forces them to rush through their presentation. A better approach is to do more with less. Narrow your content, avoid unnecessary elaboration (often a sign of nervousness), and talk slower. Adding a couple of seconds of silence at strategic points in your presentation increases audience attention and comprehension. Don't go overboard with speaking parts. I've seen teams try to fit 4-5 speakers within a 20- to 25-minute presentation. It's awkward and usually puts some people in speaking roles who aren't very good at it. A better approach is to involve some team members informally, by asking them prerehearsed questions. They can then demonstrate what they know with more confidence and credibility than struggling through a formal speaking part. Make sure your visual aids are really aids. PowerPoint has gained a bad reputation for a reason: Most people don't know how to use it effectively. When you throw 5-6 lengthy bullet points on the screen at once (which is common), your slide is competing with rather than assisting you. Keep this point in mind: People can't read and listen at the same time. Don't use your slides as notes. Bring up one brief bullet point at a time. Better still, use graphic images to illustrate your points. Prepare for the most difficult questions the client could ask. Firms often focus all their attention on the presentation and ignore preparing for the Q&A. That's a mistake. The presentation is usually pretty open-ended; the client's not really sure what to expect. But the Q&A portion of the interview is planned by the client, often to test the competing firms. Sometimes their questions are related to specific concerns they have about your firm, and if you stumble in your answer it serves to reinforce those concerns. So try to identify those tough questions in advance and have your answer ready. Take measures to counteract your vulnerabilities. The shortlist interview is as much a process of elimination as it is one of selection. The client is looking for both positives and negatives in an effort to distinguish your firm from the others. So you are wise to consider where your firm might be perceived as deficient and determine how you can combat those concerns. I prefer a frontal attack. Suppose, for example, that you are preparing for an interview with a new client and the incumbent is also shortlisted. Do you simply ignore mentioning the obvious hoping the client won't notice? I don't think so. I'd suggest saying something like, "The incumbent obviously has an advantage we don't--they've had the privilege of working with you. Let me tell you what steps we propose to close the gap between them and us in terms of the working relationship." Such honesty, in my mind, helps build trust.